City Used Office Furniture is the UK’s leading supplier of second hand office desks including radial, wave and straights desks with matching pedestals and storage. Whether you are looking to furnish an entire office or a single desk for the home we have plenty of choice. We also offer free local delivery on all orders and free site surveys. For more information about any of our products and services, please contact us for more details. 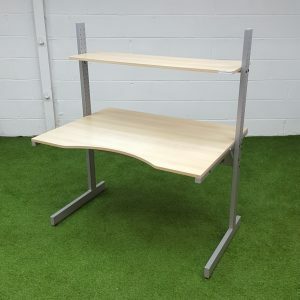 [description] => City Used Office Furniture is the UK’s leading supplier of second hand office desks including radial, wave and straights desks with matching pedestals and storage. Whether you are looking to furnish an entire office or a single desk for the home we have plenty of choice. [post_content] => This modern cantilever desk has a maple finish and features 2 portholes for tidy cable management. We also have matching pedestal storage units available too, as pictured. [post_content] => Second hand office sit stand workstation desk in a contemporary Maple finish.